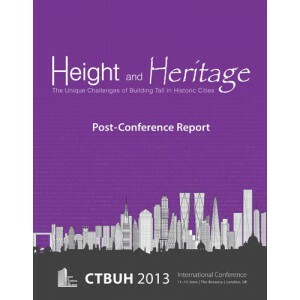 The full-color, 74-page report covers the complete experience of the three-day “Height and Heritage” conference, held in London from June 11-13, 2013, including panels, presentations, social networking events and technical tours. The report is prefaced by relevant contextual data and reportage on the state of skyscrapers in Europe. Included in the volume are two DVDs, containing copies of all presentation materials, as well as video highlights of presentations, social networking events and technical tours.